Power on/off: 5 quick clicks of the fire button to turn on/off the device. Keep holding the fire button to take a puff when the device is powered on. Charging: simply plug the device in to a wall adapter or a computer via USB cable to charge. 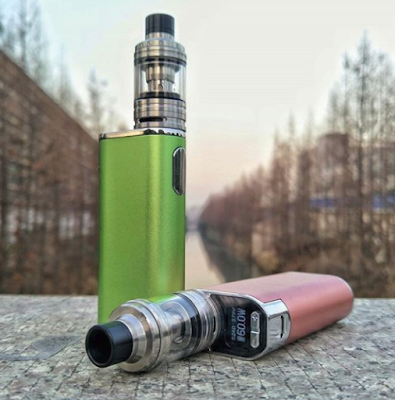 Choose a vaping mode: when the device is powered on, press the fire button 3 times in quick succession, the device will display current vaping mode. Press the + or - button to switch among VW, Bypass, TC-Ni, TC-Ti, TC-SS, TCR-M1, TCR-M2, TCR-M3 modes and then press the fire button once or stay in the interface for about 10 seconds to confirm the vaping mode you chose. Adjust wattage: in VW mode, the wattage can be adjusted by pressing +/- button. Keep holding +/- button to increase/decrease the wattage rapidly. In TC (Ni, Ti, SS, TCR-M1/M2/M3) mode, first press the fire button 4 times in quick succession and then press +/- button to adjust the wattage. Adjust temperature: in TC-Ni/TC-Ti/TC-SS/TCR(M1,M2,M3) mode, simply press + button or - button to increase or decrease the temperature setting. Adjustment buttons lock/unlock: keep pressing + button and - button simultaneously for two seconds when the device is powered on to lock and unlock the two adjustment buttons. Turn display upside down: in power-off state, keep pressing + button and - button simultaneously for two seconds, the screen display will rotate 180 degrees. Stealth on/off: in power-on state, keep pressing the fire button and - button simultaneously to switch between Stealth On and Stealth Off. Turn ENU (Temperature Protection for Charging) on/off: in power-on state, press the fire button twice in quick succession repeatedly to turn ENU on/off. When the device is plugged in to charge in ENU-on state, if temperature of the device is lower than -5℃ or higher than 50℃, the screen will respectively display “BATTERY TOO COLD” or “BATTERY TOO HOT”. In both situations, the device won’t charge.